After a cancer diagnosis, your life is full of uncertainties. At SCBHS you can be certain that you’ll receive the best personalized care to meet your needs close to home. Our certified oncology nurses work closely with your oncologist and/or physician in all aspects of your therapy and monitor your progress comprehensively. Our dietician and pharmacist are always available to help answer your questions and design a personalized treatment plan for a comfortable lifestyle. 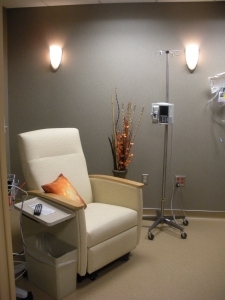 Our Oncology suite provides a warm, comfortable and private setting for chemotherapy. Family and friends are always welcome to accompany you to your therapy treatments.